Interpersonal and communication skills are crucial to a successful doctor-patient relationship. 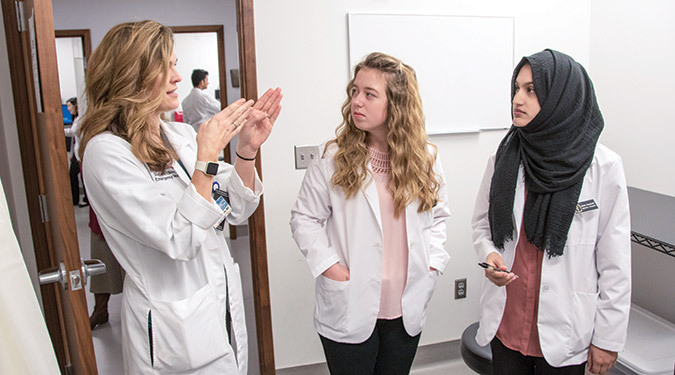 Through immediate and ongoing patient interaction, our students learn to engage with patients, families and other members of the health care team (interprofessional collaboration). Our graduates are able to establish a therapeutic relationship with patients, regardless of age or cultural background, and are able to communicate in an effective manner. It is important for both medical students and graduates to have an acute sense of professional behavior during interactions with others in clinical, academic, and co-curricular activities. Students master the professional behaviors of respect, compassion and empathy, altruism, honesty, excellence and accountability. In addition, our students are taught the value of moral reasoning and ethical judgment and learn to identify ethical issues in medicine, evaluate ethical choices, and recommend and defend those choices. Our graduates have the ability to recognize individual patient value systems, while integrating moral reasoning and ethical judgment in the care of patients without compromising their own ethical integrity. They learn the personal and professional development skills necessary to demonstrate healthy coping mechanisms and respond well to stress.